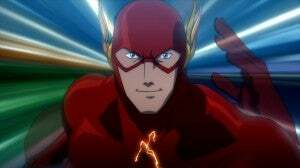 Justice League: The Flashpoint Paradox is coming to DVD, Blu-ray, OnDemand and digital download on July 30, 2013, according to Newsarama. Kevin Conroy, who will play Bruce Wayne/Batman in the film, first revealed its existence a year ago. Not long after that, Warner Bros. Animation confirmed its existence. Based on the best-selling miniseries by Geoff Johns and Andy Kubert, the story follows Barry Allen (The Flash) through the DC Multiverse in a story that served as the impetus for the "New 52" relaunch of the DC Comics. "When time travel allows a past wrong to be righted for The Flash and his family, the ripples of the event prove disastrous as a fractured, alternate reality now exists where a Justice League never formed, and even Superman is nowhere to be found. Teaming with a grittier, more violent Dark Knight and Cyborg, Flash races to restore the continuity of his original timeline while this new world is ravaged by a fierce war between Wonder Woman's Amazons and Aquaman’s Atlanteans. With breath taking action and an all-star voice cast, it's a bold, emotional vision that will forever change the landscape of the DC Universe." Besides Conroy, a number of other DC Animation veterans will return to reprise their old roles in the film. Ron Perlman will be back as Slade Wilson, Dana Delany returns to Lois Lane and Vanessa Marshall will be reprising her role from Justice League: Crisis on Two Earths as Wonder Woman. Newsarama claims that other key casting announcements, including Flash, Cyborg, Reverse Flash, Aquaman, and Thomas Wayne/Batman will be revealed soon.